What is it that is lighting up the dark portion of the moon? No, it's not my neighbor's very bright street lamp. 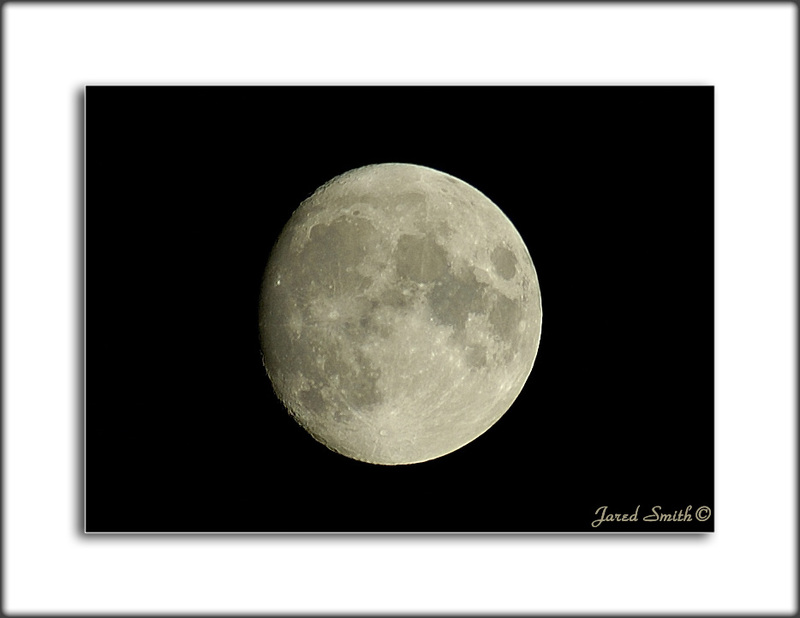 Instead, it is the reflection of sunlight off of the earth and onto the Moon. The sun had set just a few hours before, so the moon is almost directly between the sun and Earth, allowing it to catch a lot of the reflected sunlight. The bright 'star' in the upper left is the planet Venus. Full moons get their names from Native American's who kept track of the seasons by full moons. 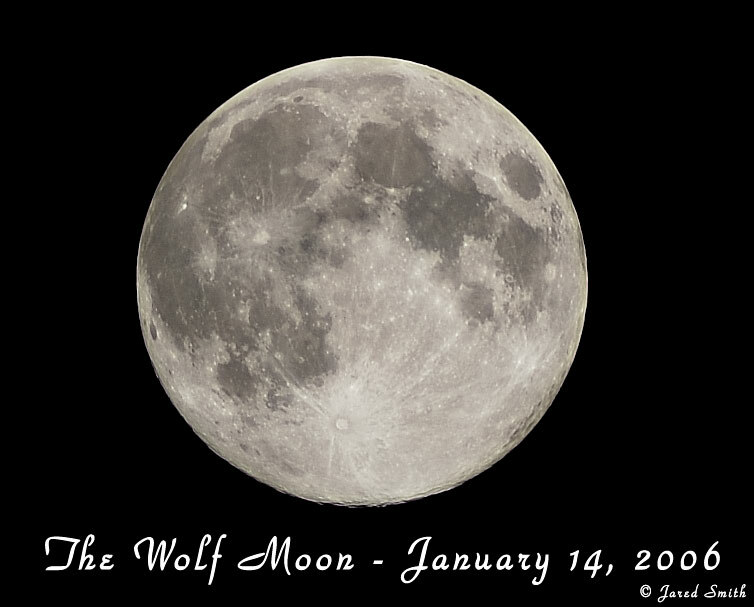 January's full moon is called the Wolf Moon. 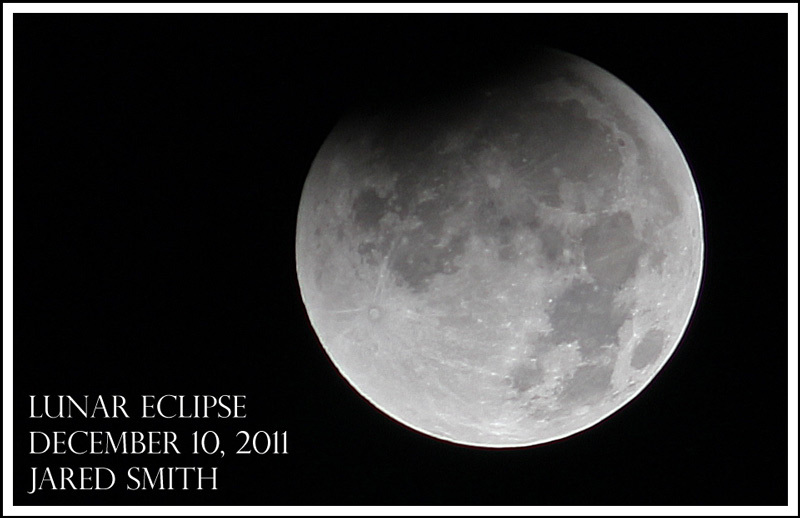 It's been cloudy and cold for a long time and tonight was the first real clear night in several weeks. It was too cold for the whole setup, so I took out my new Orion Short Tube 80mm f/5 telescope (my new guidescope) and thought I'd see how it held up to photography. 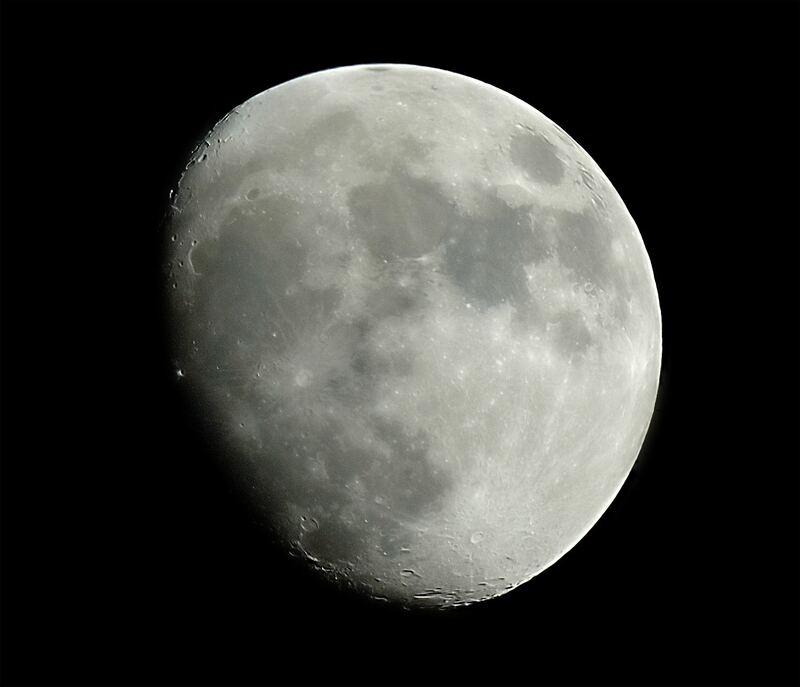 Nikon D70 through the ST80. 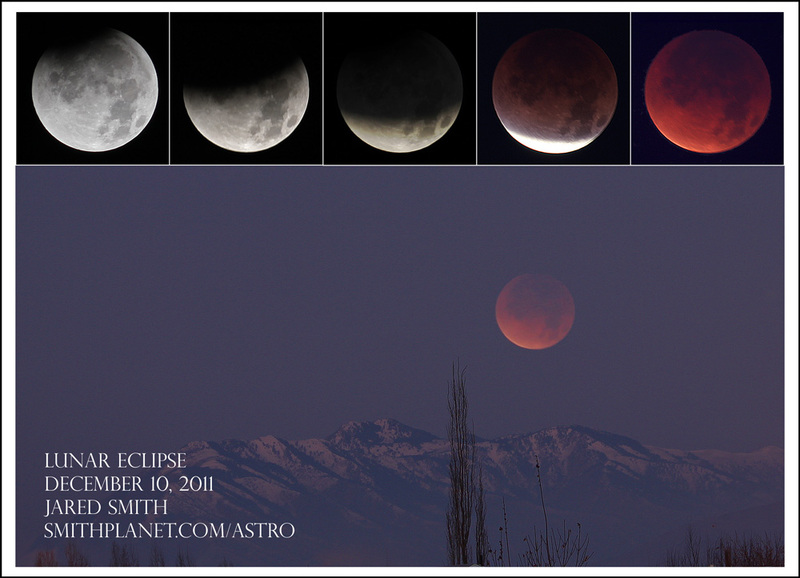 Stack of 8 photos in Registax. ISO200, 1/1600 second. Mouse over the image to see labels and a couple of the Apollo landing sites. This is my first image taken with my new Celestron Neximage CCD camera. 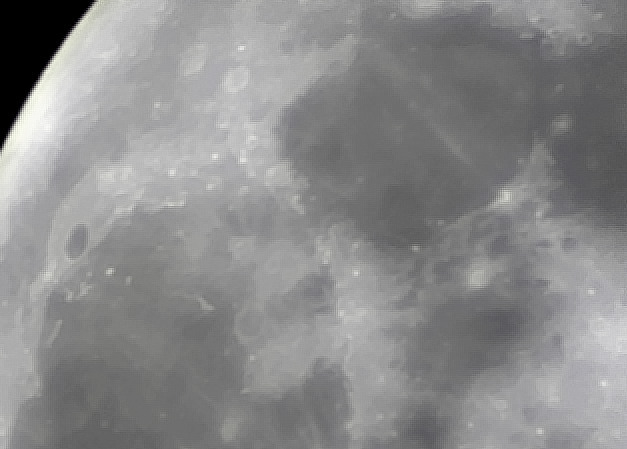 It was taken through the ST80 and a 2X barlow. This is a stack of around 150 frames from an avi movie file registered and stacked with Registax. To give you an idea of scale, Mare Serenitatis is about 350 miles (550 km) across. 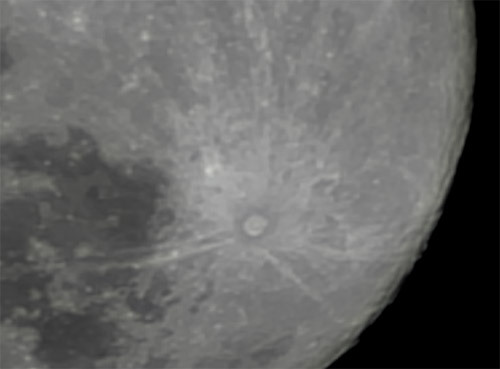 The area around the crater Tycho. A stack of around 300 frames. Processed with Registax. Tycho is 50 miles (80 km) across. I took this photo in December 2005, but just now (in June 2006) found it again and put it in the gallery. 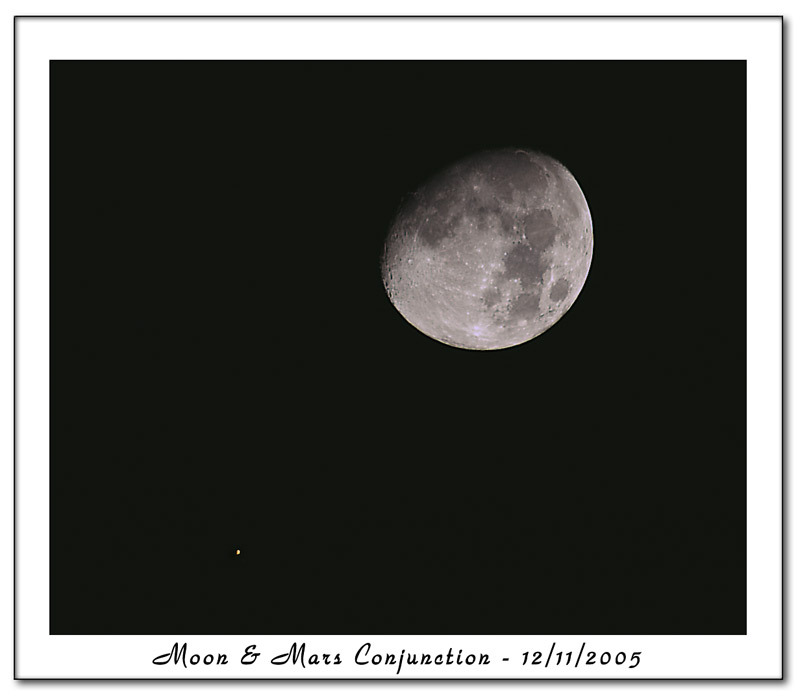 It's not an overly amazing photo, but does show a close passing of the Moon and Mars when Mars was nearly the brightest and biggest it will be in many years. A more detailed explanation of some interesting characteristics of Mars at this time is found in the Conjunction gallery. 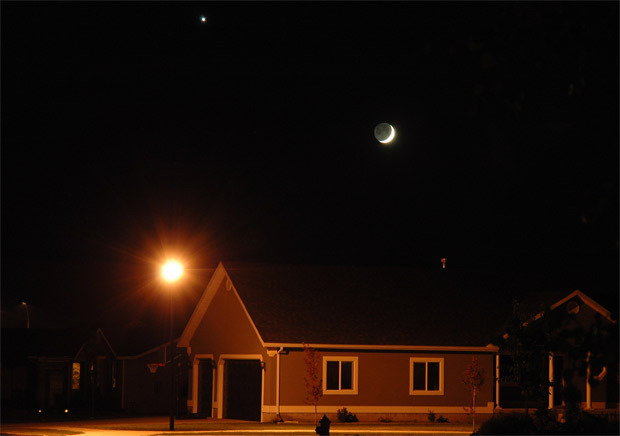 While I don't remember the exact details of this photo, I remember that the Mars portion is an additive stack of several exposures and the Moon portion was a normative stack of 2 or 3 exposures. The nearly full moon on my 30th birthday. Click for a full size version. The moon is a quite colorful place. It is just so bright and flat that our eyes can't discern the colors very well. With a camera, you can bring out the saturation of the colors. Such an image also reveals much about the minerals on the lunar surface. Click on the image to expand it. Scroll horizontally to view the entire panorama. A series of several images captured over the space of about 1 minute. Notice the lateral (South to North) movement of the trees in the foreground? What causes this? Hint: This is not caused by the rotation of the Earth in that direction. The Earth rotates to the East (or counter clock-wise as seen from above the North pole). Thus, the moon rises in the East. The Earth is not rotating toward the North at that rate. Because the photo is taken from a northern latitude. The plane of the moon's orbit around the Earth is close to (actually 5 degrees off from) the plane of the Earth's rotation. When I watch a moon rise (or a sunrise), I am looking down (southward) across the Earth and onto the plane of the moon's orbit. Thus, the foreground appears to be moving to the North. If I was near the equator and on the same plane as the moons rotation around the Earth, the moon would rise straight up and I'd see no foreground movement. If I had photographed this same photo in the southern hemisphere, the foreground would appear to move from left to right, just opposite of my photo. You can see this by taking a one large ball (Earth) and one small ball (Moon). Orbit the small ball around the large ball's equator. Now view the (ball) moonrise from a position above the equator (northern hemisphere) of the big ball (Earth) and you'll notice that the horizon of the big ball appears to move from right (South) to left (North). View it from towards the bottom of the ball and the horizon will appear to move just the opposite. This model will work fine to represent what is happening although you must remember that we are talking about rotation of the Earth and not the orbiting of the moon around the Earth - either way, the visual movement of the horizon is the same. The trees are on Flat Top Mountain above Smithfield, Utah and are about 2 miles from where I took the photo.